Experience all that maintenance free living has to offer in this stunning Mara Villa residence located behind the gates of Prestancia. This villa features two-story ceilings, open living and dining areas, neutral finishes, large-scale neutral tile and hardwood floors, plantation shutters, and a stunning two-story lanai with views of the 1st fairway of TPC Stadium golf course. The combined living and dining room features large banks of doors and windows that bring the light in to further enhance this beautiful open space. The spacious kitchen is open to the adjacent family room and boasts white cabinets, light Corian countertops, a double bowl under mount sink, a decorative tile back splash and newer appliances. 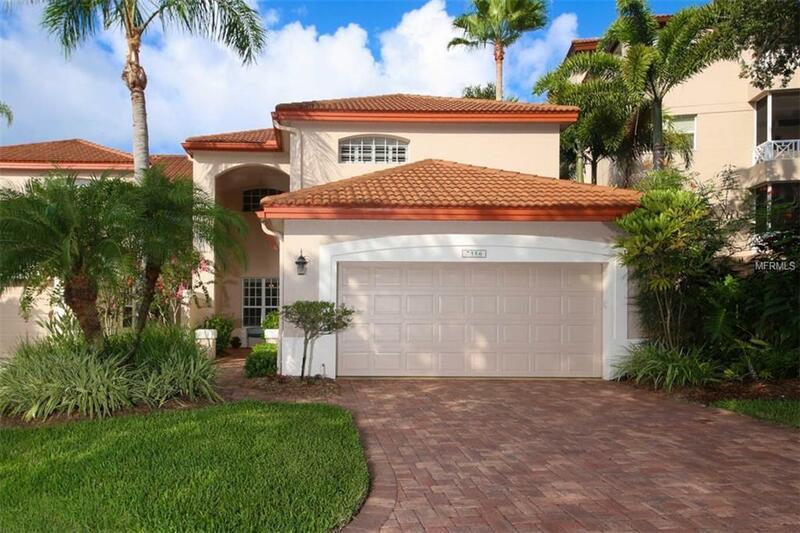 Both living and family room open to the lanai with a two-story cage, paver decking and tranquil stone water feature. The upstairs features an expansive master suite with private balcony; guest bedroom and bathroom as well as an open loft area that could be used for a casual sitting area or an office. Enjoy the amazing community pool and spa in Mara Villa as well as all of the amenities of living in this prestigious gated community, including optional membership at TPC Prestancia Golf Club featuring two 18-hole courses. Additional Lease Restrictions Minimum is 30 Days And Only Up To 6 Times A Year.